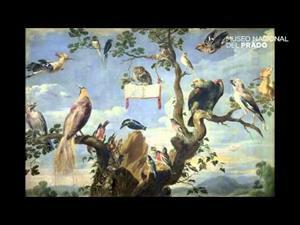 In this composition, various species of birds perched on the branches of a tree -a stork, an eagle, a red macaw, etc.- sing around a musical score. As in many of Frans Snyders’ compositions, the largest birds on the ends protect the smaller ones. According to Sánchez Cantón, this work comes from the collection of the Count-Duke of Olivares’ cousin, don Diego de Mejía y Felípez de Guzmán, I Marquis of Leganés. Leganés estate of 1652-1655 actually listed some fifty-two works by that artist and the present piece later entered the Royal Collection. Images of different kinds of birds perched on trees, sometimes with musical scores, were known as Concerts of birds and were popularized by Flemish artists in the early decades of the 17th century, especially Frans Snyders. They were quite common at that time, and the I Marquis of Leganés, don Diego Messía Felípez de Guzmán, had as may as four in his collection, two of which are now at the Museo del Prado, both by Snyders (P01758 and P01761). During the first half of the 17th century, few collectors in Madrid had works by Snyders, but they became more common in the second half of the century, when they hung in houses and palaces around the city. This subject actually antedates the baroque custom of aviaries; it began in the Middle Ages and Snyders was not the first to explore it in paintings, as there were numerous representations of Aeolus with the Birds in the final years of the 16th century. Northern European collectors used them as decorations above doors or windows, or in front of fireplaces, and the fashion later spread to Spain. Their symbolic significance is linked to representations of Franciscan birds associated with the worship of the Virgin Mary as Our Lady of the Birds, which began in 13th century. The Concerts of Birds have also been considered allusions to the sense of hearing, although the interpretation is unclear. Other readings allude to the possibility that they represent wisdom via the owl, an animal emblematic of that concept, who sometimes seems to be directing those bucolic concerts. Moreover, these concerts of birds symbolically refer to concerted order in nature, a sense of balance with nature evoked by the musical systematization of birdsong. Thus, in general, their meaning involves the political and social order enjoyed by the owners of these paintings under the rule of Archduke Albert of Austria and Isabel Clara Eugenia. That explains their popularity in bourgeois and aristocratic homes, from whence the entered the leading museums. The subject was much exploited by Snyders’ followers, both in Flanders and France. In the Spanish Netherlands, these included Paul de Vos, Jan Fyt and Jan Van Kessel and in the Dutch Republic the subject was revised by artists such as Gysbert, Melchior d’Hondecoeter, Abraham Bisschot and Jacobus Victors to make it more courtly. In France, it was explored by Nicasius Bernaerts and Pieter Boel (Text drawn from Pérez Preciado, J. J.: Arte y Diplomacia de la Monarquía Hispánica en el siglo XVII, 2003, pp. 281-285). Height: 79 cm. ; Width: 151 cm. Collection of the I Marqués de Leganés, 1652-55, nº 60; Royal Collection (Torre de la Parada, El Pardo-Madrid; New Royal Palace, Madrid, “paso de tribuna y trascuartos”, 1772, n. 1019; New Royal Palace, Madrid, “cuarto de la serenísima infanta-dormitorio”, 1794, n. 1019). Díaz Padrón, Matías, Museo del Prado: catálogo de pinturas. Escuela flamenca, Museo del Prado; Patrimonio Nacional de Museos, Madrid, 1975, pp. 368. Díaz Padrón, Matías, Pedro Pablo Rubens (1577-1640): exposición homenaje, Ministerio de Cultura, Dirección General de Patrimonio, 1978. Díaz Padrón, Matías, La Escuela Flamenca del Siglo XVII, Ediciones Alfiz, Madrid, 1983, pp. 76. Os descobrimentos portugueses e a Europa do renascimento, XVII EXPOSIÇAO EUROPEIA DE ARTE..., Consello Da Europa, Lisboa, 1983. Museo Nacional del Prado, Museo del Prado: catálogo de las pinturas, Museo del Prado, Madrid, 1985, pp. 646. Robels, Hella, Frans Snyders. Stibellen-Und Tiermaler 1579-1657, Deutscher Kunstverlag, Múnich, 1989, pp. 305,306/ lám.195. Koslow, Susan, Frans Snyders. Peintre Animalier et de Natures Mortes 1579-1, Fonds Mercator Paribas, Anvers, 1995, pp. 293. Díaz Padrón, Matías, El siglo de Rubens en el Museo del Prado: catálogo razonado, Prensa Ibérica, Barcelona, 1996, pp. 1258. La materia de los sueños : Cristóbal Colón, Junta de Castilla y León, Socieda, Valladolid, 2006. Inv. Carlos III, Palacio Nuevo, 1772. Núm. 1019. Inv. Testamentaría Carlos III, Palacio Nuevo, 1794. Núm. 1019. Catálogo Museo del Prado, 1854-1858. Núm. 1557. Inv. Real Museo, 1857. Núm. 1557. Sneyders. / 1557. Coro de aves. / Están repartidas en las ramas de un arbol, de donde cuelga un papel de musica. / Alto 2 pies, 10 pulg; ancho 5 pies, 5 pulg. Catálogo Museo del Prado, 1872-1907. Núm. 1688. Catálogo Museo del Prado, 1910. Núm. 1761. Catálogo Museo del Prado, 1933. Núm. 1761. Catálogo Museo del Prado, 1942-1996. Núm. 1761.